A PEACE trip to Rwanda in some ways feels like a trip back in time to first century Christianity. The entire country in unashamed about being on fire for Christ. There is an unspoken dignity among the people and a palpable presence of the local church everywhere. Leaving Kigali we traveled to the western province and the city of Kibuye. Rwanda is the country of a thousand hills and we must have passed by 500 of them on our three hour drive there. We had the privilege of meeting with a pastor who leads a rural church in this farming sector of Rwanda. His church has implemented the Orphan Care Initiative in a way that so reflects his congregation. We were greeted with worship and the clamoring of loving children who could not wait to sit next to us. The pastor spoke about how families in his church were adopting orphans, attending parenting classes and forming savings groups. Four of his members shared their testimonies, their love for their church, their love for the pastor, and their dependence upon Christ. One lady had overcome alcohol, accepted Christ, then found her self- worth in Jesus and not in the bottle. Once healthy, she had gone on to adopt and to participate in a savings group. Another had adopted, added to her own biological family, participated in a savings group and with that money had bought a pig because pigs reproduce quickly. Investing in livestock was a ticket out of poverty. Her son is now completing his university education. 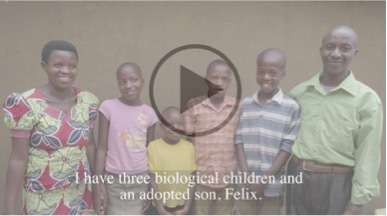 All four church members had adopted and given orphaned children loving mommies and daddies. They all proudly held up their savings books because savings groups had pulled them out of poverty. It was beautiful to see how Orphan Care initiative and Savings Groups Initiative work hand in hand to help families, with the church being the center of their success. We followed the pastor to a home visit whereby he regularly visits his members who have adopted to check in on the family and the welfare of the children. Five of us were invited in to this humble home with a dirt floor, mud construction and love that just exuded. The husband was working and the wife invited us in to share her testimony and to minister to us with her remarkable story. Years ago she and a man in her village found a seven month old abandoned baby girl and brought her to the local orphanage. They kept thinking about the baby all the time, and their love for her prompted them to get married and then to adopt her. She is their oldest child is now 12 years old. Since that time, the mother and her husband had two biological boys. When we asked her daughter about school she beamed and the pastor praised her on how much hard work she puts into her learning. 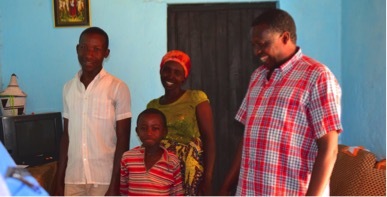 The family had joined a savings group, bought a cow and some chickens, and added onto their one room home. The church is a family to families who adopt, orphanages are closing, children are being raised in loving families and the church is the hub of it all. We witnessed the PEACE Plan in action.